Have a question for V.J. Island View? Ideal for fun and relaxation, V.J. Island View is located in the Klong Prao Beach area of Koh Chang. From here, guests can enjoy easy access to all that the lively city has to offer. With its convenient location, the hotel offers easy access to the city's must-see destinations. V.J. Island View offers impeccable service and all the essential amenities to invigorate travelers. This hotel offers numerous on-site facilities to satisfy even the most discerning guest. The hotel features 96 beautifully appointed guest rooms, many of which include towels, closet, internet access – wireless (complimentary), non smoking rooms, air conditioning. Besides, the hotel's host of recreational offerings ensures you have plenty to do during your stay. V.J. Island View is a smart choice for travelers to Koh Chang, offering a relaxed and hassle-free stay every time. Exactly what it says on the tin. Basic, comfortable big beds, AC worked well. The room was quite a dark room though, hot and cold showers. Can’t say much else really, nothing special but nothing to complain about. Only seen the staff on check in and check out. I would stay here again. A lovely hotel, very well decorated with a cosy hall and very well furbished rooms. Perfect for a romance with your partner. Maybe a bit far from the center (historical center and the new CBD) but it's so good to taste a bif of luxury. Nice roof-top. The swimming pool is maybe a bit small. 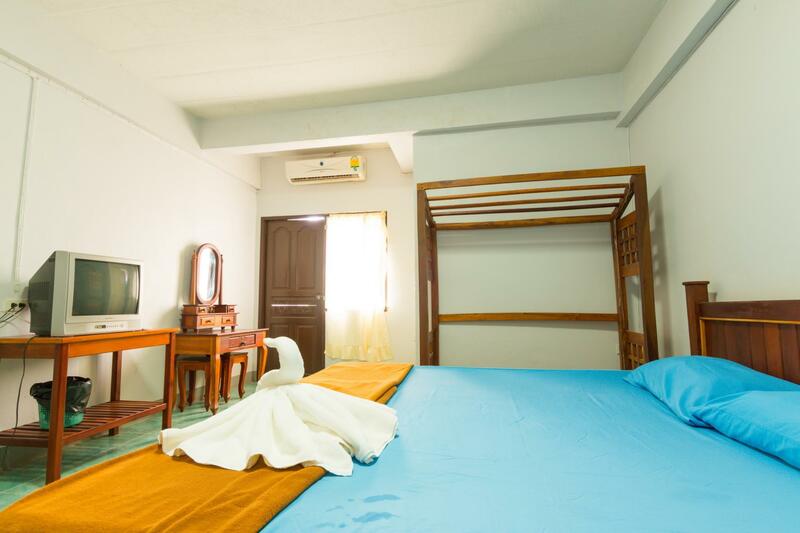 this kind of accommodation is suitable for backackers or others who would like to stay in cheap accommodation with quite full facikities such as car park, air-conditioning, tv, refridgerator and ensuite bathroom. however, the room and bathroom are not quite clean. It takes 15 minutes to the nearest Chai Chet beach.Acturally it is not on Klong Prao Beach but Chai Chet Beach.It is near V.J.Plaza which is well-known for the locals. Rooms are large for 2 people,with refrigerator and water heater.But there are mosquitos in the room after raining.Room service is terrible. There could be nobody at reception when any help is needed.Even when I checked-out,I could only get some help from the laundry. Good deal for the price and location. But that's all. I would recommend to stay there only in case you have to leave the island early in the morning. Water heater almost doesn't work, aircon is very loud. Thanks because we stayed there just for one night the hotel is really disgusting, dirty or better to say...super disgusting. The walls of the room were almost black because there black spot on it, The bed sheets were dirty too and no words for the toilet....no comments.If you can don't go there even for one night, there are many better options on the island. Cheap, ok location and pretty quiet surroundings. The rooms have everything you need: ac, fridge, tv and bathroom with shower. They are cheap so don't expect 5 star standard (duh). Basically its pretty good for this price range and you pretty much need a motorbike on Koh Chang where ever you live so the location is not a problem. It was close to food. It had a laundry service. Aside from that, this place sucked. It was dirty, smelly and disgusting. The beed came with one dirty sheet and no blankets. When I asked for a blanket, they were pissed. The place reeked of urine. It was incredibly dirty. The bed was incredibly hard. The pillows were stained. we needed to try 5 different rooms before getting one that was ok. we waited 20 minutes for the receptionist to appear in the office to check in. an issue with agoda: i have tried to get my name spelled correctly in your computerized program. note: you cannot use spell check for a person's surname! The hotel is probably 20-25 years old and i would say that internet photographs of the hotel were taken when it first opened. The hotel is dirty and run down and really needs to be closed down then totaly refurbished and new mattresses on every bed before opening again at a higher price, The hotel at the moment is neither clean nor comfortable. Also it is 4.2 kilometers away from the main White Sand Beach area of Koh Chang, so if you do not go by car, you are up for another 280baht per day for a motor cycle and fuel. As the hotel stands at the moment i would only recommend it as a back packer hotel but it could improve if refurbished. I would not stot stay there again. This place was difficult to find. Two different cabs couldn't fnd it, but it ended up being very close to the ferry. We only stayed one night and I would not reccomend more. Rooms were small and dirty. But what can you expect for the extremely cheap price? If you need a very cheap place to stay, this will do the job. There are a few restaurants around that are pretty good. Close to convenience store. Pros: I got two towels and a good bed. Cons: Noisy air condition, toilet was broken, uncomfortable atmosphere. I got there late and there was nobody at the reception desk anymore. Had to argue with the guard to get my keys. It's ok for a short time stay while you search for a better alternative but for a stay of 7 days or longer. No service like restaurant, etc in the hotel and there WiFi (which you have to pay for) is not available in all the rooms. Not the nicest place to stay, the place is a little dirty, but the room was clean enough. This place is ideal to stay for a night or two to give you a chance to have a look around the island and find something better. good location bit on the insider but peaceful,good restaurants around hotel. Hotel was average,good for budget travellers,basic ammenities like bed & bath rooms,no breakfast,room cleaning average,beds too hard,towels too dirty,location was good with a big supermarket & some good restaurants around the hotel.1 italian restaurant worth trying...'MARCO & JO'Italian restaurant.good food.If you rent a bike from hotel they charge you 200 baht per day & gasoline you have to refill...worth & good to go around the island.Overall average hotel.may be spend few hundred baht more & prefer to take a decent hotel with pool or on the beach. We booked a twin room (2 single beds) but when we got there the staff said that all rooms were doubles (even though there was a picture of a twin room as well as an option to choose such a room in the online booking). The staff are unfriendly. The hotel facilities are old and the place isn't very clean either - there are loads of insects and insect droppings around the place. The bed is a stiff board - really uncomfortable to sleep on. The fridge is empty except for a few dead coackroaches and mosquitoes. There's also a strange smell in the corridors. Would not stay here again and would not recommend others to stay here either. We booked a twin room (2 single beds) but when we got there the staff said that all rooms were doubles (even though there was a picture of a twin room as well as an option to choose such a room in the online booking). The staff are unfriendly. The hotel facilities are old and the place isn't very clean either - there are insects everywhere and insect droppings all around. The bed is a stiff board - extremely uncomfortable to sleep on. The fridge is empty except for a few dead cockroaches and mosquitoes. Would not stay here and would not recommend staying here again.